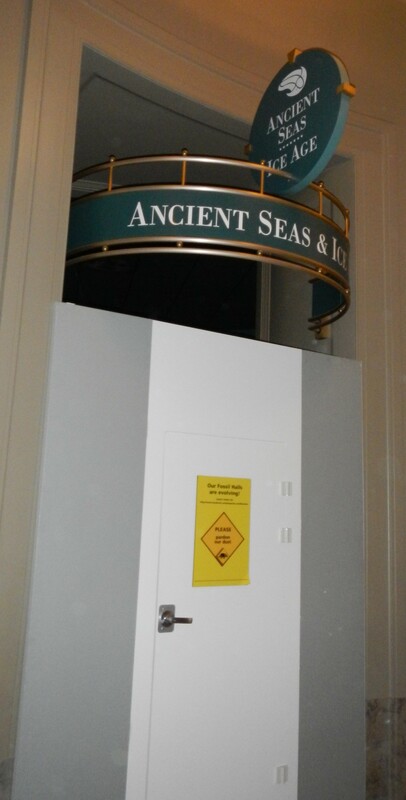 First, it was the closing of the Life in the Ancient Seas Exhibit (see my blog post from August 2013 – and as you can see in the image to the left, the exhibit that opened on May 18, 1990, finally closed on October 21, 2013). And now, it feels like an entire book is about to close at the Smithsonian Institution’s National Museum of Natural History (NMNH). 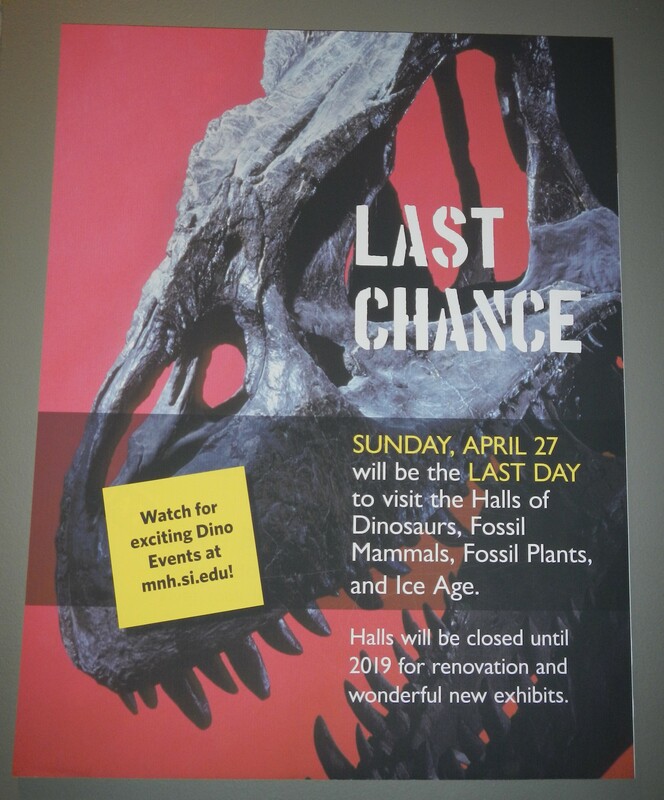 On Monday, April 28, The National Fossil Hall (affectionately referred to as the Dinosaur Hall) at the Smithsonian will close to visitors and not be seen again until 2019. The reason? Below is text from a sign at the museum that explains why. “Since we last renovated the fossil hall in the early 1980s, scientific understanding of our planet’s history – and our place in it – has changed. We’re redesigning our halls to feature the latest science, showcase some of our 46 million fossils, and create an exceptional experience for visitors like you. This all makes perfect sense to me. With so many significant and important fossil specimens on display, museum scientists need to pay careful attention to everything from the vibrations generated from visitors walking by the dinosaur mounts to the fluctuating humidity levels in the museum (especially with the hall right off the main entrance). And then, there is always the fact that science keeps changing, and new knowledge means that new and updated displays need to be created. Although I can’t count the number of times I have roamed the National Fossil Hall myself, and the number of times I have taken students to see this spectacular collection, I knew I wanted to see the dinosaurs one final time before the exhibit closed. The last time I will walk through the main entrance way to the fossil hall and see this view. 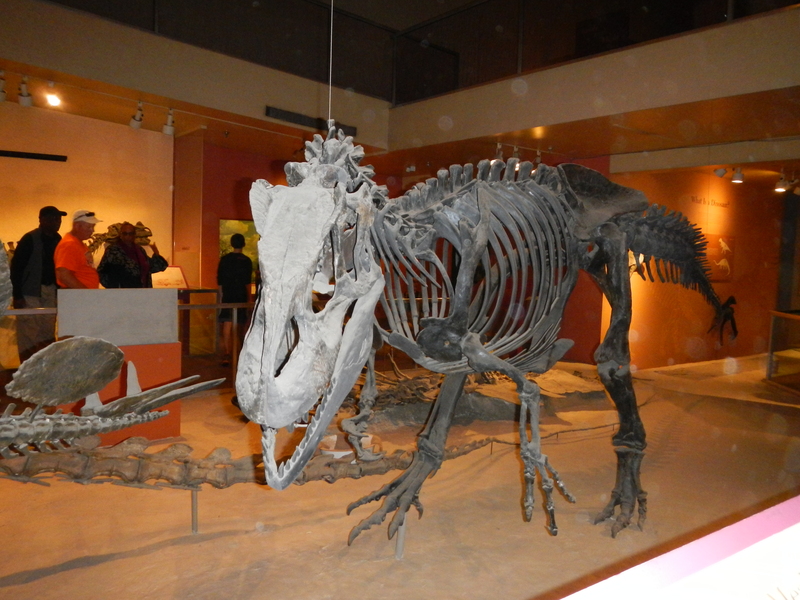 The Allosaurus, with the evidence of broken bones that re-healed. Just me and the Diceratops! OK, the Triceratops Hatcher is certainly one of my favorites, too, but I had no chance of getting a clear shot of him today (be sure to check out this Smithsonian story about the scanning and building of Hatcher!). 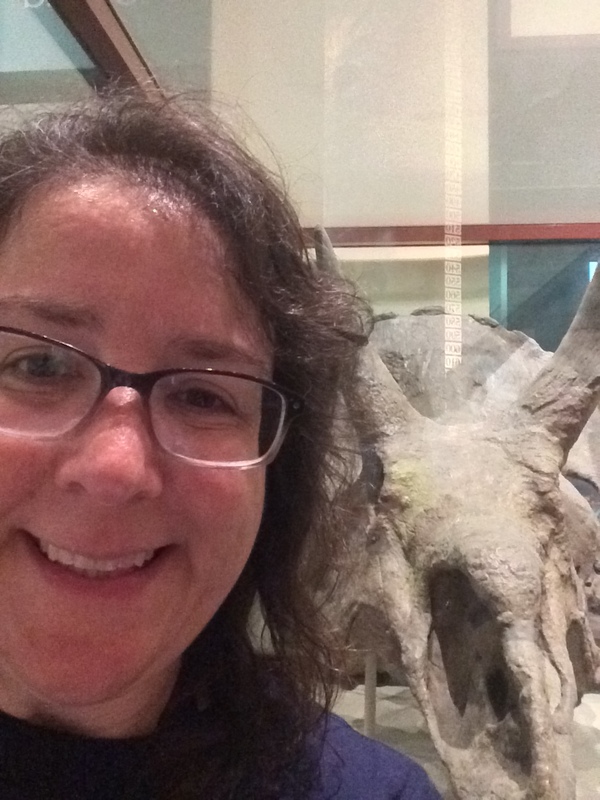 I think one of the specimens that has the most fascinating story is the Diceratops you see in the selfie to the left (check out his complicated history in this Smithsonian Magazine article). I was disappointed to see that the Smithsonian had already removed some of the specimens that were in display cases against the walls. And the stairs up to the flying reptile exhibit was already closed off for construction. I was hoping to have one last view from on top of the dinosaur hall, but I wasn’t able to have that chance. 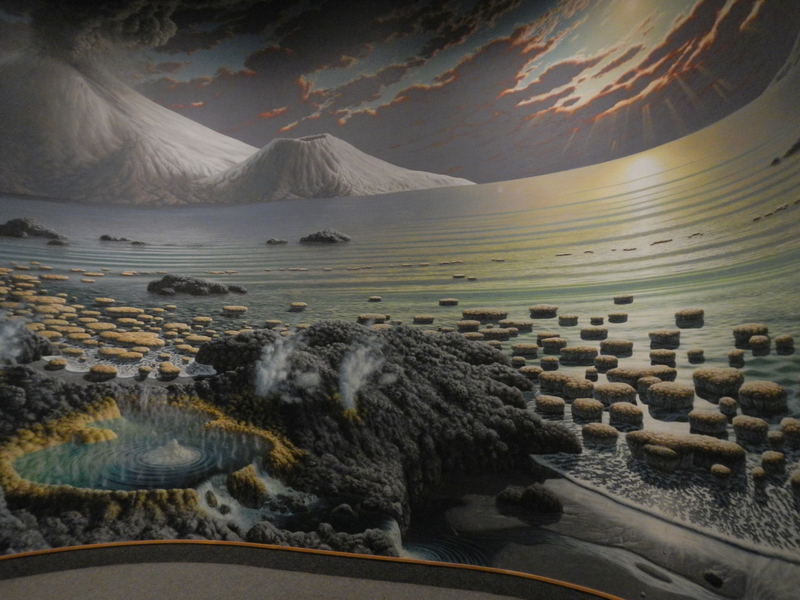 The giant BIF was also removed, and it is sad to think that perhaps some of these beautiful murals in the fossil hall may never be seen again. If the Smithsonian no longer wants this, I’m sure I can find a spot on my classroom wall for this stromatolite-filled Archean landscape! So what is the good news in all of this? Yes, the Smithsonian will have updated scientific and educational displays in five years. Yes, the Smithsonian will now be home to what is being called the “Nation’s T. rex” – who has already had his first Twitter chat (in fact, he has been incredibly active on social media at @NMNH – smart move for the Smithsonian). And the Smithsonian has been very good at engaging people in the existing hall up to the last minute, encouraging people to take selfies and submit them to the Fossil Hall Fotorama, and final weekend Dino Film Fest. Once the hall closes on Monday, visitors will have to go across the hall to check out The Rex Room to see how the Nation’s T. rex is being studied, conserved, and mounted. If you want to learn more about the journey of the Nation’s T. rex from the Museum of the Rockies to Washington DC (yes, it came via FedEx), check out this Smithsonian Magazine story. 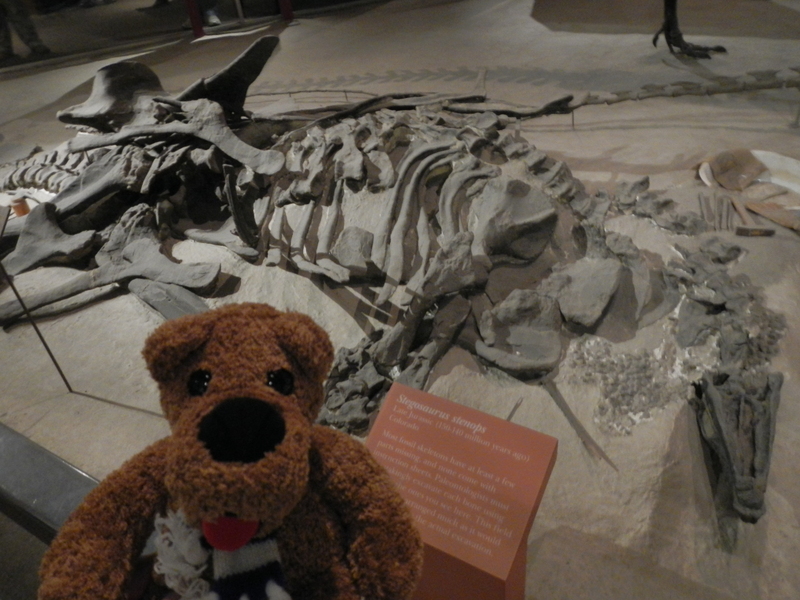 In the meantime, I’ll keep checking out the website for The National Fossil Hall and The Rex Room for updates. We can always hope that the Wankel T. rex doesn’t leave us waiting for five years to make an appearance! 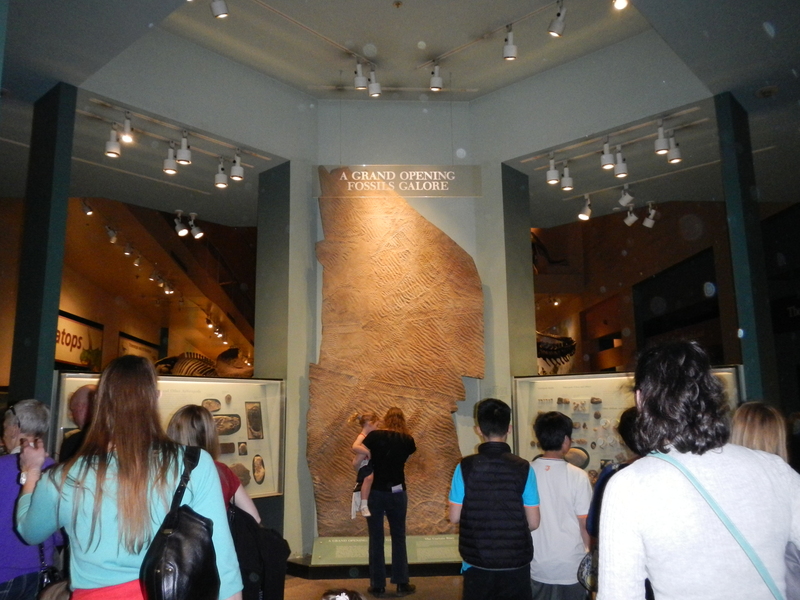 I took advantage of my last chance to see the Fossil Hall… sorry, historical geology students! Maybe we can have a reunion in five years to see the opening of the new hall!